Chicago Ward Gives Budgetary Power To The People The alderman in the 49th Ward became the first elected official in the country to hand over the purse strings to his constituents in 2009. Three years later, the "participatory budgeting" experiment is still attracting new residents to planning meetings. 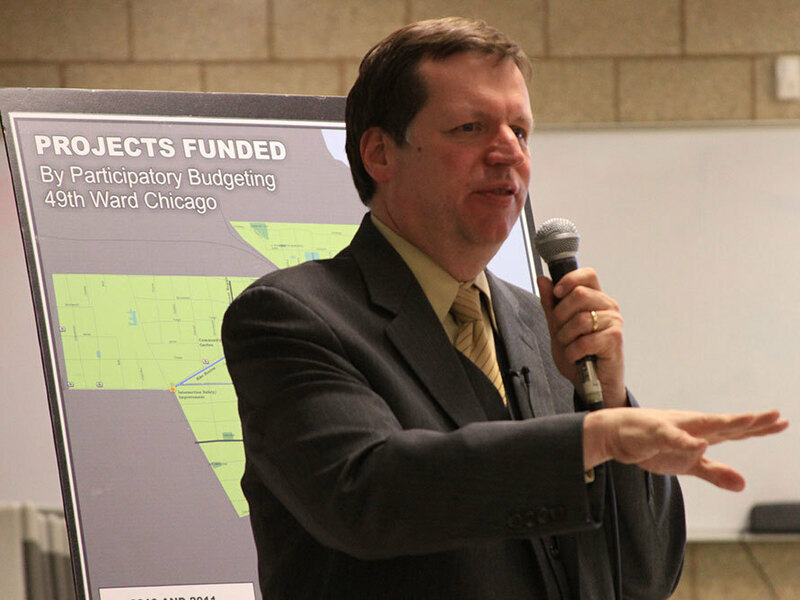 In Chicago's Rogers Park, Alderman Joe Moore handed the purse strings over to his constituents. Chicago's 49th Ward is better known as Rogers Park. It's a neighborhood of middle-class houses and apartment buildings, home to Loyola University. It's known for diversity and an affordable, laid-back kind of cool. But the 49th has a new claim to fame: In 2009, the ward's alderman, Joe Moore, became the first elected official in the country to hand over the purse strings to his constituents. Three years later, the experiment is still attracting new residents to planning meetings. "I am ceding my power to decide how this money is spent and giving it to you," Moore said to a group of about 40 people on a cold November night last fall. Residents sat in folding chairs at the Willye B. White Community Center as Moore told them that each ward in Chicago gets $1.3 million a year from the city to spend on capital improvements. Usually, the aldermen themselves decide how to spend the money. For the third year, Moore is using an alternative process called "participatory budgeting." The first step is a series of neighborhood meetings, where people call out ideas. Among those offering ideas in the community center was Robin McPherson, a grandmother in her 50s. She is polite but intense, with a gold cross around her neck. McPherson works for a nonprofit group, helping to house people with HIV. She has lived in the neighborhood for decades, but this was her first participatory budgeting meeting. She signed up to serve on one of the volunteer committees that spend months meeting and doing research. They pare down long lists of projects from these first meetings to just a few items that go on a ballot for a special spring election. McPherson had a project of her own in mind. In her neighborhood park, there are two poles stuck into a concrete slab, essentially a pair of showers for children to stand under on a hot day. Since one of those children is McPherson's 2-year-old granddaughter, she wanted something fancier. She envisioned water rings for the kids to go through with "whirly water" spraying in all directions. "I just think it would bring a lot of families together, different cultures and ethnic groups," she said. For Moore, getting people like McPherson involved in city government is one of the biggest benefits of participatory budgeting. He says about 400 people attended the nine neighborhood meetings last fall. "I've never held a community meeting that had 400 people attending," he says. Rogers Park resident Robin McPherson wants to spend some of the neighborhood's budget on a water park. Giving budget power to residents has changed what gets done with infrastructure money. When Moore called the shots, he chose only meat-and-potatoes projects — street repairs, a new crossing signal or two. Under the new scheme, the ward's residents have funded showers at the beach, heated bus shelters and a $110,000 dog park. Some skeptics say participatory budgeting allows small voting blocs to band together and push through pet projects. Those who like the process say that at least with this approach the people wielding power are not the rich or well-connected. Instead, they're regular citizens who choose to put in the time. In January, two months after the first neighborhood meetings, McPherson was on the Parks and Environment Committee. She had gathered photos of different water features and information on the potential price tag for her idea. McPherson left the meeting encouraged, feeling confident her project would get on the ballot. Three months later, on a spring Saturday, the participatory budgeting vote took place in a school cafeteria. More than 1,300 people cast ballots, voting on 21 projects and how much to spend on street repairs. McPherson spent the day trying to sell her water park project to voters. She and dozens of others gathered at a neighborhood bar next to the L tracks to hear Moore announce the results. Fifty-three percent of the $1 million budget goes to street repairs. The rest: trees for a park, sidewalks, a playground and ... murals. But no water park. McPherson's project fell a couple hundred votes short. "We need that water park in this community. I'm just preparing myself for next year, to work even harder," she said. 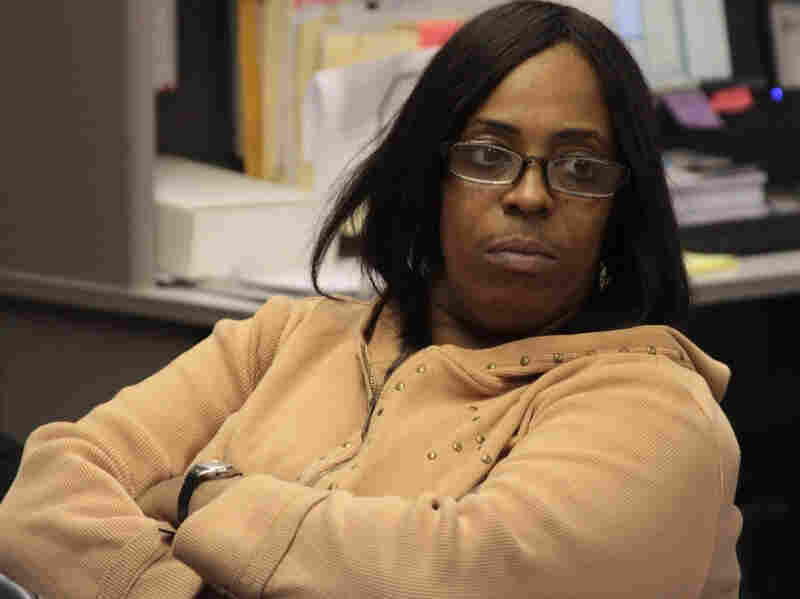 She vowed to double her 322 votes in next year's election. But McPherson said she was happy. She agreed with her alderman that letting the people make budgeting decisions helps to bring the neighborhood together. Several council members in New York City have now adopted the strategy, and it may soon spread to more wards in Chicago and to medium-sized towns in California and North Carolina. This story is from the Groundwork project of the Center for Documentary Studies at Duke University.